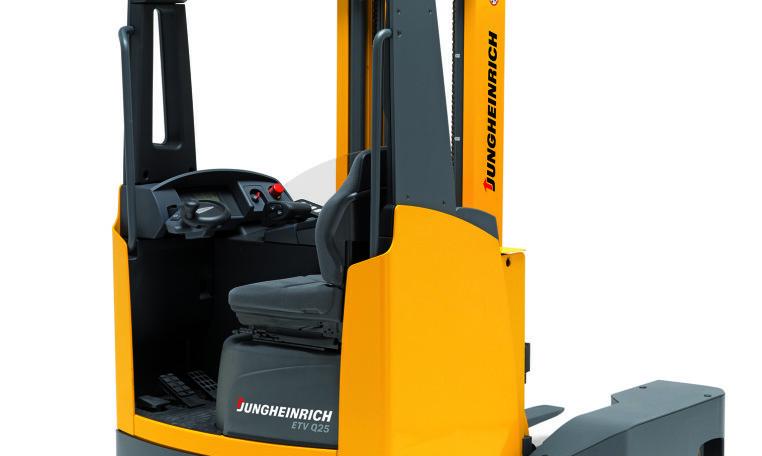 The Jungheinrich ETV QC 20-25 series of multi-directional reach trucks are used wherever long loads are transported in narrow aisles and need to be elevated at height. With their electric all-wheel steering they can transport loads up to 8 m long, maximising space in the warehouse. There are five travel programs available, ranging from modified normal travel, turning on the spot through to transverse and parallel travel. In ‘enhanced normal travel’, the already small turning radius is reduced further by simultaneous load wheel steering. The advantages of 360° steering are also available: Minimum turning radius and rapid direction change.